If you think meeting relatives whom you have not seen in ages during family gatherings is awkward, just imagine having to dig up your dead ancestors and dancing around with them every seven years! 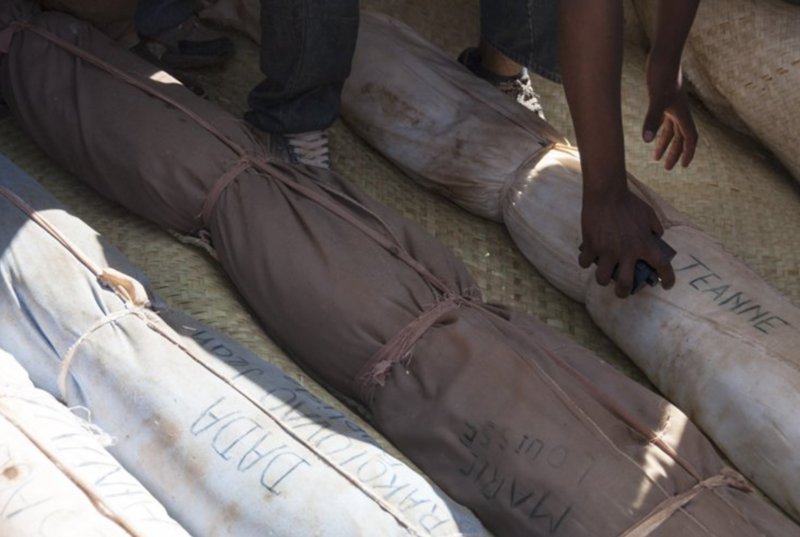 The Merina Tribe in the Southern highlands of Antan, Madagascar take their family gatherings very seriously and they make it a point to ensure that every member of the family is present — including their dead relatives. Yes, you read that right. The Merina people actually dig up the corpses of their deceased ancestors and hold a huge celebration in their honour! 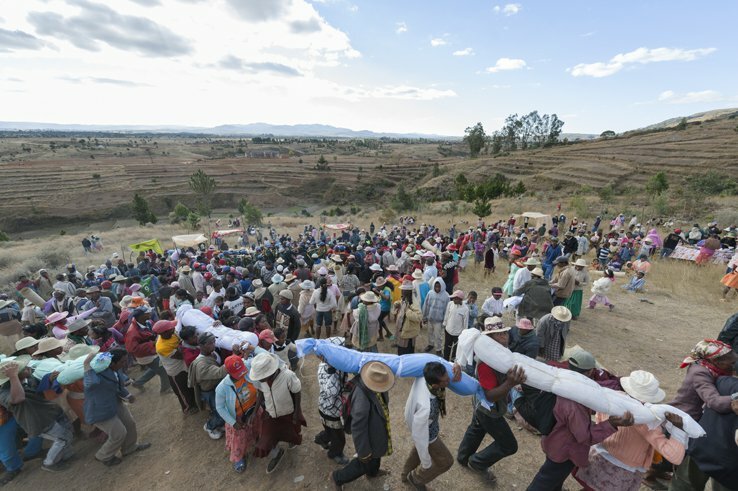 This unique but exquisite festival is called ‘Famadihana’ in the Malagasy language or ‘Turning of the Bones’ when translated to English. 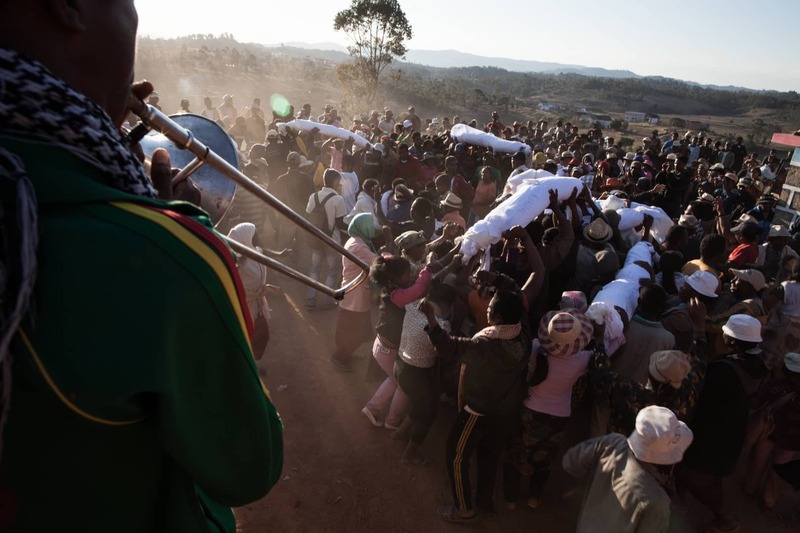 In the southern highlands of Madagascar, death is not the end. It is believed that their ancestor’s spirits are everywhere. They could be in the trees, in the air and even in animals. 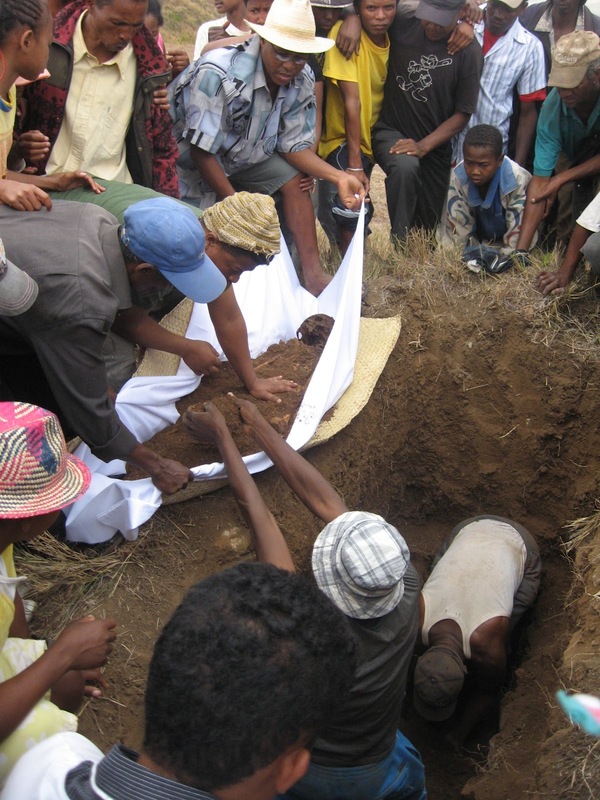 Malagasy people believe that once somebody dies, they are still able to communicate with the living and that they have not permanently left this world unless their body has fully decomposed. In fact, locals say you should never point your fingers outstretched as this may offend the spirits roaming around. The main purposes for having the celebration is to help those who have recently died crossover to the afterlife and to bond the family through the generations. Just like any other family, the Merina tribe will organise a family reunion every now and then (usually every seven years). The reunion brings together all generations of the family including those who have already passed on. 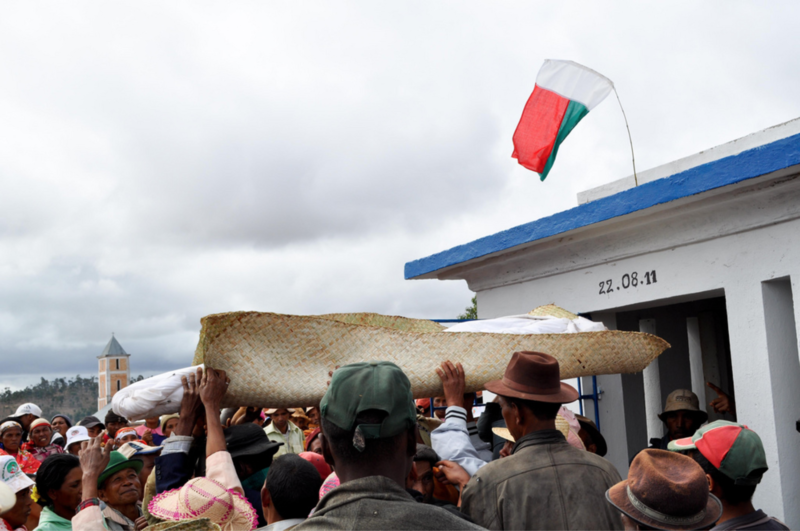 The Malagasy forefathers are very highly regarded and hence, this celebration acts as a form of ancestral worship too. Having the celebration every seven years is good news for families hosting the festival as it is very costly. A lavish meal of vary be menaka which translates to ‘rice with much oil’ is prepared for the guests from fattened zebu, chicken, pig, fish, and on top of that they need to prepare new clothes for the corpse and guests. However, some families cannot afford to hold it or let alone build a crypt as people pay more to build a crypt than they do their houses (Madagascar is one of the poorest countries earning an average of $409.92 USD per capita). It is mandatory that a family holds Famadihana as it is deemed extremely disrespectful to the ancestors not to hold this celebration. Families will live extremely thrifty lifestyles to the extent they starve themselves until they can afford to hold Famadihana. On the day of the festival the party gathers at the crypt to get ready to welcome their ancestors back. Since there are two worlds, the tribe believes that the dead who have crossed over to afterlife leave the crypt and only come back for Famadihana to reunite with family because it gets cold and boring inside. On the day of Famadihana, the whole family from all over the island travel down to the village where the family crypt resides. 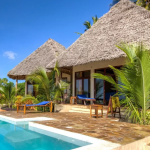 The ambience is festive and joyous; a band will play loud Malagasy music from their brass instruments, and hundreds of people from well-dressed men and women to barefoot babbling infants will be dancing, cheering and singing together. People pay more for a family crypt because it represents their identity. There are two types of crypts; traditional and modern. The bodies wrapped in cloth are laid on shelves in the tombs; each crypt can hold up to 12 bodies. A modern family crypt is often seen as a structure built above ground with a small door acting as an entrance to a small room, built partially underground. A traditional crypt would be built underground. The entrance will be a hole in the ground, which in most cases leads to a staircase to the chamber holding the bodies. Men start digging at the entrance of the tomb, tossing mounds of dirt to one side to make space for the entryway. Famadihana is about to begin. Once the door is opened, you will hear cheers or even people shouting the deceased names’ out of happiness. Representatives proceed inside the small room to help move the bodies out. When you first step inside it, you are engulfed in the smell of decaying flesh. It is a very peculiar smell, sweet and sour but rancid. 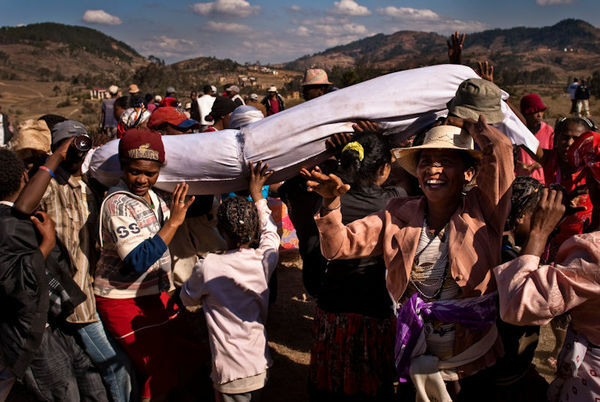 The cloth cloaked bodies are brought out one by one wrapped in straw mats, they are passed over the crowd of bobbing heads and gyrating bodies almost like they are crowd surfing. The energy is contagious with everyone beaming with happiness, and more often than not you will come across a warm toothless smile from an elder. Being sad or crying is banned from the celebration, this is seen as rejecting blessings from the ancestors. The corpse is then redressed in new lambas (the silk cloth it is wrapped in) to keep the corpse warm. It is symbolic that the redressing is done on the laps of zana-drazana (children of the ancestors). The name of the ancestor is written on the new cloth for recognition. They are then left on the straw mats to sun bake as the Malagasy people believe that the sun is their source of energy. While the corpses are laying in the sun, the elders teach the younger ones that Famadihana is a day to show their family how much they love them and the significance of their ancestors laying on the mats. The corpses are then hoisted above the peoples’ heads and paraded around their final resting place as a symbol of the spirits get familiar with it. Malagasy people believe that the spirits will roam around terrorising people if they are not familiar with the area around the tomb. Throughout the whole ceremony, the music, dancing and singing do not stop just like a real party. Just before the sun sets, the corpses are returned to the tomb as the tribe believes that nightfall brings negative energy and evil power. They are brought in head first and placed upside down (this is where the ‘Turning of the Bones’ comes in) to close the cycle of life and death, gifts of money and alcohol are buried along with them. Before leaving for home, guests collect objects touched by the corpses like mats and the old lambas as lucky charms. Women who have trouble conceiving put these lucky charms under their mattresses. What if you weren’t invited? Famadihana is a celebration that is traditionally exclusive to the immediate family only. 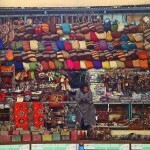 However, it is very popular with the Malagasy people that even neighbours join in the festivities. If one wishes to join the ceremony, they would have to bring sao-drazana (ancestors thanksgiving) of money and alcohol as an act of solidarity. Visitors are also encouraged to bring ornaments that the deceased used to like. One ancestor named Jeanne loved make up and making herself look good, after she was redressed, perfume was sprinkled over her body. Marie Louisse’ favourite drink was beer, so her corpse was doused in Three Horses Beer; the locally brewed beer. Dancing with the dead – A dying tradition? Famadihana celebration only dates back to the seventeenth century. 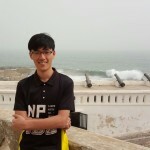 Since then, the modernisation and introduction of new ideologies to the country have morphed some of the locals’ views on the ceremony. A minority believe that there is no need to hold such a celebration as to them it is a huge waste of money. Some also say that it is impossible to talk to the dead. 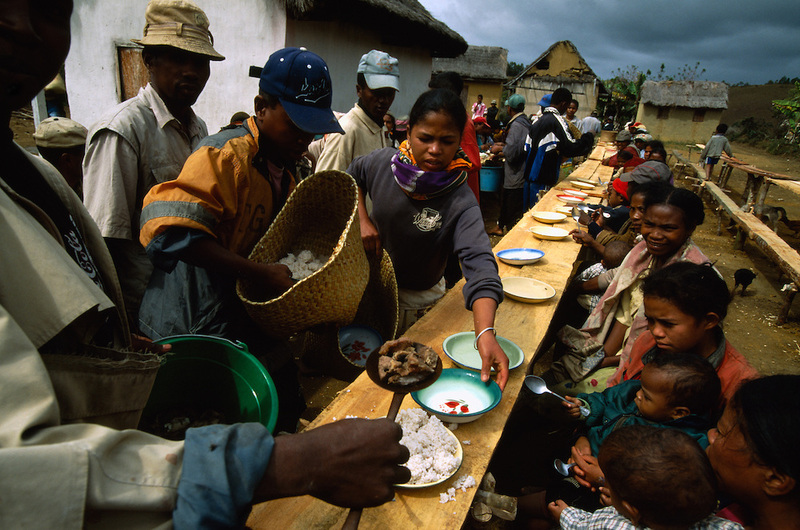 There is a growing Christian community in Madagascar, as a result, the evangelic protestants discourage Famadihana as they see it as a religious ritual unlike the Catholic Church which sees it as a cultural ceremony instead. 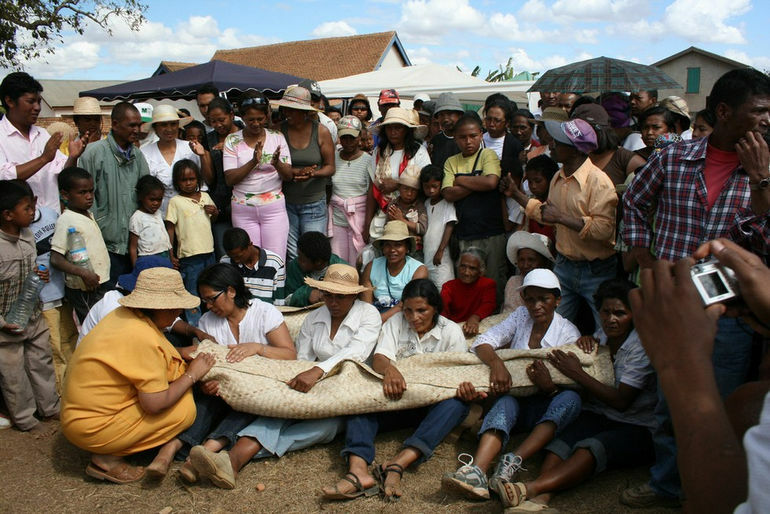 Famadihana is just one of the unique traditions carried out by the people of Madagascar. We may find it odd or even weird but it is actually such an emotional and beautiful way of honouring their ancestors. There are many interesting traditions just like Famadihana that you probably did not know of like Sky Burials in Tibet and Rambu Solo in Sulawesi, Indonesia just to name a couple. 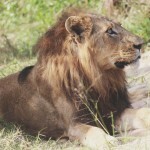 If you are thinking of an exotic place to visit, Madagascar is the place for you! Make a trip down at the right time and you may be lucky enough to dance with the Merina Tribe of Madagascar! To watch the exciting process of Famadihana, click here!